I have known about this book since it came out, but I do not remember why I never bought it. Perhaps it was first published as an expensive academic publication? The colofon says: copyright 2004, but first issued as a paperback 2009. In that case I still could have bought it 8 years ago. The subtitle is “Traditionalism and the secret intellectual history of the twentieth century”. That already implies that the book is not just a biography of the most famous Traditionalists. It looks a bit like the author had to stretch the concept a bit to fill the book though. The book starts with chapters about “Traditionalism” and “Perrenialism”. In these chapters you will find the biography of René Gunénon. His adventures in esotericism and occultism, his pursuit of an academic career and eventually how he started to walk his own path. It shows that Guénon was but a man with his own failures. Sedgewick portrays him as an armchair esotericist who writes about Hinduism without ever having been to a Hindu country or even met a Hindu. Also it took a long time before Guénon actually became a practical Traditionalist. His early initiations into orders that often did not fit his later frames were all abandoned and Guénon did not follow an exoteric religion until he moved to Cairo and that was not even his own idea. Also in these chapters you will learn about Ananda Coomaraswamy and the way these two persons were in contact with a whole range of people. The next part of the book is about “Traditionalism in practice” and here we first follow Frithjof Schuon and his Sufi order that at some point started to drift away from ‘Guénonian Traditionalism’. After this we move to the political dimension of Traditionalism and (of course) focuses of Julius Evola. In the last part, Sedgewick describes how Traditionalism spread over the world through (neo-)Sufi orders, the academia (Mircea Eliade) and people with Traditionalist leanings, but not Traditionalists per se. Especially in that last part the information gets a bit ‘thin’. Stories about people and organisations who may have never read a single Traditionalist book, but shared elements of the philosophy are described along with currents that fit the book better in my opinion. Overall the book is fairly interesting. The writings of some Traditionalists get some context. In what phase did Guénon, Schuon, Nasr, etc. write a certain book? It is somewhat interesting to see what became of Traditionalism, but I agree with critics that Sedgewick focuses quite a bit on politics that are only vaguely aligned with Traditionalism, such as certain currents in Russia. The book is ‘de-mystifying’ in the regard that Sedgewick does not shy to describe the mistakes and flaws of the people involved. Some will call him anti-Traditionalist for that, but to me, Sedgewick does not come across that way; not entirely in favor either, but I think he is a genuinely interested scholar. 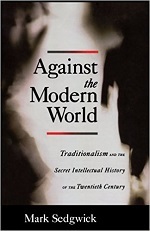 “Against The Modern World” makes a descent book to get some context to Traditionalism from a non-Traditionalist author.